We can come to your event and sell ice cream to the attendees. We will donate 20% of the proceeds to your charity or group. You must be able to guarantee a minimum number of people will attend the event. Please call (650) 940-9831 to set up your fundraiser. Our previous fundraiser was a great success, attended by local fire fighters. 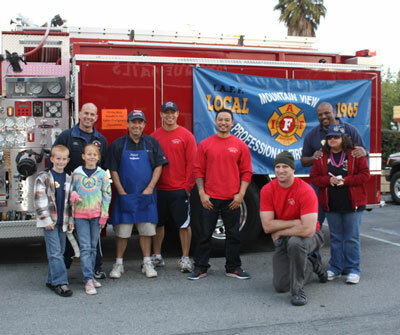 This event was held as a fundraiser for the Mountain View Fire Department. Fire fighters assist the staff in serving scoops to our customers. Designate a certain night as a fundraiser for your group or charity, and tell your members to visit our shop. We will donate 20% of the proceeds for that night to your group or charity. We have done this kind of event in the past for the Mountain View Educational Foundation, which raises money for local elementary and middle schools.